I originally heard about Laosthas duo on the streets, before they were a formal band. When I found out they were from San Jose, I decided to contact them and we immediately clicked. 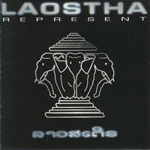 Shortly after, I funded and produced their first master CD, and their first album “Laostha”. By luck, we managed to get an investor to fund our first 2000 copies of CD to sell, but had a hard time selling it. It took about a year before we could even sell 1000 CDs (out of the back of my trunk!). We were about to give up, until one graet week went by and I was suddenly getting phones calls from all sorts of stores. I was overwhelmed that people were calling all the way from east coast. They were ordering CDs at wholesale amounts and became steady clients. After about 5000 copies of the first album were sold, we decided to make the second album “Represent”. It took about six months to complete recording and production. “Represent” became a hit right away and fans were begining to contact us directly. At that time, I was also working to promote Brandon’s single to be included with Laostha’s album. We started booking performances in San Diego and Texas and Brandon became the ladies favorite. I remember a day in Amarillo, Texas where he was signing girls breast with permanent markers. We also booked Boston, but unfortunately the group broke up before that happened. We had many fans and many people also gave feedback about our music. Laostha had a “fobby” accent in the music and it was appreciated by many, but also mocked by many. Laostha’s style was well respected by the Laotian adult males. Laotian women were disgusted by the vulgar lyrics but could find amusement in them. In general, we found that Lao people were so chill. They can dislike something and just laugh it off. When I first started in the music business, my family members were not supportive at all. They thought I was wasting my time and waited for my day to fail. When they heard the finished music product, it even disgust them more. This only fueled and pushed me harder to succeed. After our break-up, we went our own ways. Laostha tried to do a third album and I was getting complaints even though I didn’t produced it. Laostha had their share of “expressing their anger” regarding the breakup in their new songs, but there’s no grudge between us anymore. Buc Lae and Singh Sly are living in San Jose now and we are considering whether we should get together again and work on another album. We are all very excited and overwhelmed to hear that there was a Laostha song in the background of Nerakhoon — I just hope they can list us on the credits! Thank you Lae Manivanh, Sly Phomkai, Brandon Daranouvongs for making my experience in music a part of my life.